On February the 26th, 2014 my 11 year old daughter was having a fantastic time jumping into freshly made snow hills that the snow plow made at school and on the last jump she tripped, fell, and broke her leg. During this entire time at the hospital, 6.5 hours in total, my daughter sat and waited in a wheelchair and while I sat next to her all those hours I was thinking about my yarn that I did not grab on my way out the door! I so need to make an emergency yarn bag with a sign to remind me *Bring In Case Of Emergency* anyway, my mind started making things while I sat there and this purple wheelchair was one of them. Purple is my daughter's favorite color and she mentioned to me that if she needed a cast she would like it to be purple. A purple cast would be fun, I agreed. And she held onto that hope of a purple cast until the time came to get the cast on and it was the dreaded, plain old cream colored one which is not fun at all for a little girl. She protested but there was no purple to be found anywhere! 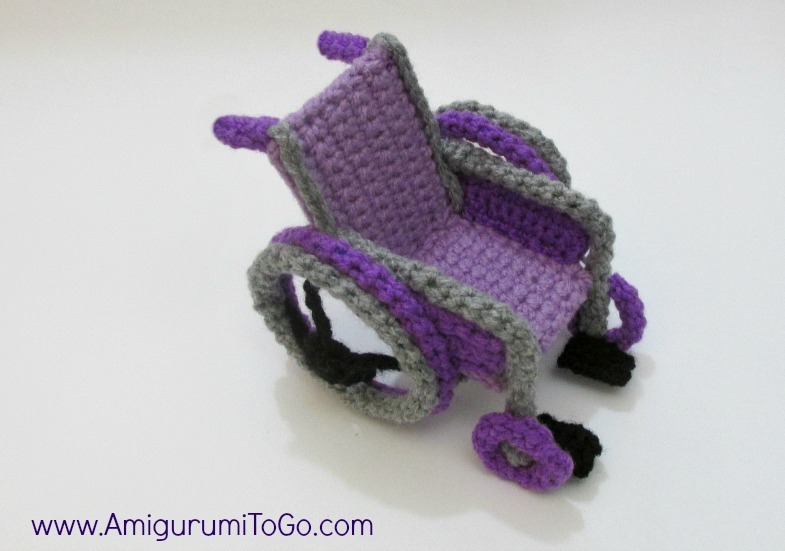 And so I was even more determined to make her this purple wheelchair as a keepsake to remember the day. After all you don't break your leg everyday! I plan to stitch the date, 02/26/2014 on that little red pillow. "A PURPLE wheelchair!! SO cool!! OMG, mom I love it!" I'm so glad she loves it! So of course there will be a pattern! I just need to work out some design details.. it'll be a while and I can't promise a date but it'll come. It's a must for other children out there who had to sit and wait in a plain old ugly wheelchair! UPDATE!! My daughter did not need surgery after all and she is healing fine! Your daughter is lucky to have such a great mom! The purple wheelchair is beautiful but your motherly dedication and love for your daughter are even more beautiful. Every young girl should be so lucky and receive such a meaningful gift in time of crisis. It's always stressful when your child hurts themselves. My son spent 3 months in a blue wheelchair we named Boris, when he got a condition that affected his feet and ability to walk. I would love to purchase the pattern from you when available to make a blue Boris for him and as a reminder how much his life has moved on from that time. I hope your daughter heels quickly. First of all, so sorry your son had to go through that for such a long time. And what a great idea to name the chair, lol that is something we would have done if she had to sit in it any longer than she did! And there will be a pattern just as soon as I can work out a small design detail in the wheels. I need to figure out something then it will be posted. It will be free and I will have a video tutorial showing how to put it all together. I just can't promise a date when it will be ready. Check back periodically or watch my facebook page, Amigurumi Freely as I announce all my latest patterns there as well. You are so clever! We should have more moms like you. I am eager for the pattern as I used to work in a nursing home and I think the little wheelchairs would be a neat thing to make and donate to their little store. You are an inspiration to us!! After so many messages on facebook and comments like yours I am very excited and motivated to get this pattern ready for everyone. I'll be working on it asap. That is so awesome you made that for her...made me cry. In a happy way of a mothers love. Praying no surgery is needed. I keep a travel bag with odds and ends yarns, scissors, yarn needle, stitch markers close by the door...oh pen and notebook too. Does your daughter show any interest in crochet? She has a great teacher if she ever does. Sorry I rambled but loved your story and your chair! Best to your girl. Yes, my daughter wants a monkey with a broken leg so I'll be working on that as well. We decided the pillow could be stitched on the back of the wheelchair or could be hung in the back off the handles. We'll figure it out. A WIP but it's a super fun one and collaborating with my daughter makes it extra special for sure. And no, you didn't ramble. I loved reading your message, thanks again! I think it is great that she has a plain cast! I mean, think of all the things you can draw on it! She can even color it purple or you can make a purple hand warmer to put over it! When I had casts, I always got colored ones but sometimes wished for a blank one to draw on, at least the ones that were not on my right arm. :( I would tell her to get creative, make her cast express herself, and OWN it. If you go to your local pharmacy (CVS, RiteAid, etc), they should have some rolls of colored 'tape' in the same section where they keep the wrist braces. They're kind of like Ace bandages, but with colors and able to stick to itself. When I fractured my wrist (over ten years ago now, wow), I was given a half-cast that was held to my hand/wrist/arm with an Ace bandage. I sometimes used this colored tape instead of, or over, the Ace bandage when the color got too boring - especially because I didn't have the type of cast my friends could draw on. I'm thinking you and your daughter could come up with some fun ways of decorating her cast with multiple colors! yor Daugther is very lucky to have such a wonderful Mother like you. Lots of payers that no surgery is needed and she heals quickly! What an awesome loving family you have! I'm in a wheelchair can't wait to make a purple one too :) . Thank you for sharing, so cute. We've featured your wheelchair pattern and associated patterns on www.treblemakinghookers.com! We Love Them All! Did she take the cast off?Hope she feels better and doesnt have any pain. Very glad to hear your daughter has mended so well. How wonderfully talented you are to have made such a beautiful keepsake for her! Hi Sharon, I've been exploring your blog & came across the purple wheelchair. I'm happy your daughter recovered without surgery & that she was thrilled with your sympathy gift. You may not know this, but purple is the official colour of chronic pain! I just thought you'd like to know this little tidbit (many diseases have designated colours) & with that info, which can easily be googled, a person could make a wheelchair in whichever colour the patient's diagnosis fits into. Oh my, I did not know that! Thanks for the info, that is interesting. My father has been in chronic pain most his life, he is now 84, but you'd never know he suffers. That is a good idea about the different colors, thanks! I might even do that one day.. make one in a particular color for someone.